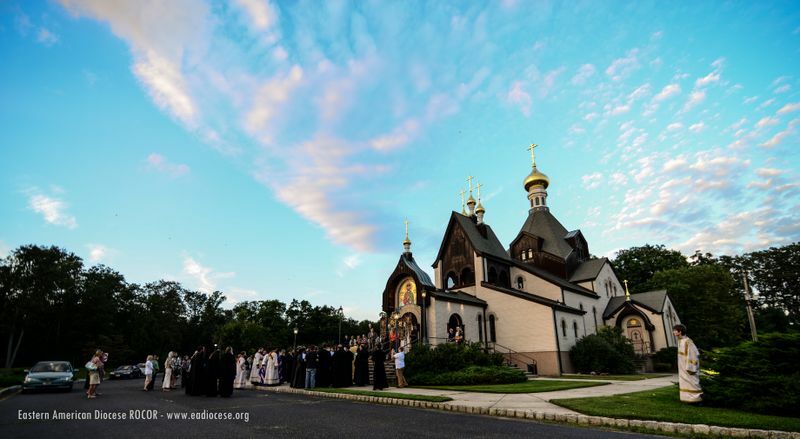 In the history of the Parish of St Alexander Nevsky, situated not 50 miles south of New York, all threads of the colorful tapestry of the Russian Emigration have intertwined, reflecting its magnificent and tragic fate. Echoes of this history are heard to this day: the graceful and laconic Russian language in which its local old inhabitants speak, the wonderful Old Russian harmonies of Divine Services and the surprisingly charitable manner of socializing between parishioners. And it began in the first fourth of the 20th century, when the first settlers from Russia appeared. Persecuted by the fiery hurricane of revolution and civil war, seeking refuge from bloody Bolshevist repression, this place attracted them with its untouched primeval nature, gentle climate, crystal clear air, and low population density. Thick pine forests surrounding the county were dotted still with unovergrown Indian paths and densely populated with various animals: deer, turkeys, hares, foxes, squirrels, ferrets, and the like. It must be noted that near this town called Lakewood are located Freehold, Tennent, and Toms River, which were focal points of the American Revolution (1775-83 AD). Many among the settlers from Russia and Ukraine were Cossacks, hailing from three Cossack Hosts: the Don, Kuban, and Terek. The settlers frequently cleared the land, building their own houses atop it, forming small villages and Cossack stanitsas [stations –trans. ]; giving them names in honor of families or events with which they were associate the specific area. Farming was widespread in those times, specifically chicken husbandry. In the 1930s, a group of Russian settlers amounting to 18 people decided to establish a mission church. Listed among the founders were L.A. Sinclair, V.V. Pozhidaev, P.K. Grigorovich-Barsky, B.M. Azhogin, V.G. Grekov, V.T. Yuritsyn, Y.Y. Bobrovnichy, etc. At that time, Dr. Alexandra Vladimirovna Plavska and her mother Julia Martinovna thought to build a vacation home in town. Toward this end, they bought a large plot of land (5 acres/about 2 ha.). However, sometime later, they decided to give the purchased land as a gift to Archbishop Vitaly (Maximenko), the contemporaneous diocesan archbishop, administering those parts. Archbishop Vitaly, seeing the needs of the re-established Russian mission, did not regard it as proper to use the land given to him as a vacation home, and handed the deed over to the parish. The cornerstone was laid in March of 1936. The Rite of Blessing the Cornerstone, along with the erected oaken cross, was performed by Archbishop Vitaly. Over the conernstone of the church, Archbishop Vitaly instructed: “I pray God that this, my firstling, the parish of St. Alexander Nevsky, might flourish as a tree planted at the waters.” It was decided to name the church and parish after the Holy Prince Alexander Nevsky (the day of his commemoration, August 30/September 12 [Julian/Gregorian Calendars – trans.] coincided with the birthday of Dr. A.V. Plavska. The street which adjoined the church was likewise named for the Great Prince). The first contribution toward the construction of the church, for the sum of $500, was given by Dr. A.V. Plavska. The remaining, less-fortunate families collected another $200, and with these meager funds ($700), construction began upon what was first a chapel, then later (1938) and actual church. The plans for the chapel, which factored its quick expansion into a church, were drawn up by V. Zavalishin. By the stoic efforts of the founders of “Russian Lakewood”, the chapel was built in less than three months. Construction of the chapel was completed on June 21, 1936. The Rite of Blessing was performed by Archpriest Sergius Panteleev. The first church ward became Leonid Alexandrovich Sinclair. One of the especially zealous participants of the construction was Vasily Mikhailovich Azhogin, subsequently-elected warden who sat in office for a period of 40 years (1943-1983). In subsequent years, the parish grew by leaps and bounds. The first expansion of the church occurred in 1938, and in that same year the parish was granted the right to autonomy, freed from its previous dependence to the Cathedral of the Holy Cross. A second expansion of the church occurs in 1948, and its great consecration, which is performed by Archbishop Vitaly. A third expansion occurs in 1956, and the construction of the belfry. And in 1956 the fourth expansion occurs, with an addition of a nave and reconstruction of the belfry. The church obtains the look which it has retained to this very day, although with a different name, which shall be addressed below. Together with the expansion of the church building, the parish community grew and developed as well. A variety of buildings were constructed. The parochial center was built in 1940, in which various scholastic/educational and benevolent programs functioned: the Sisterhood, a theatrical circle, a library, a chapter of a charity for children in emigration, a representational office for a charity for handicapped Russians, a chapter of the Russian-American Union for the protection and support of refugees from the Soviet Union, a Foundation to support Displaced Persons coming to America, a chapter of the Anticommunist center, etc. In 1956 the cultural and educational society “Rodina” constructed a building next to the church, which took on a significant portion of the social and benevolent functions of the church community. Within the walls of the “Rodina” society building there were plays, musical evenings with prominent artists, a functioning Art Studio under the direction of L.A. Lermontoff, a sports club “Vitiaz” under the direction of Y.V. Rzhevsky, a Youth Circle with areas for ping-pong, chess, reading, drawing, crafts, traditional dancing, woodcarving, etc. It’s especially important to note the museum established by the “Rodina” society, which was founded and run for 23 years by the artist Vsevolod Pavlovich Stellezky. A significant effort into the work was put forward by Baron G.N. Taube, the famous pilot B.V. Sergievsky, Prince S.S. Beloselsky-Belozersky, and others. In 1994-5, the museum, having by this time approximately forty thousand preserved specimens, was given to Moscow by a decision of the “Rodina” Society administration. But the life of St. Alexander Nevsky Parish continued its own course. In 1977 a new parochial center was built with a large hall in which church cultural and social function continue to this day: concerts, talks, lectures, meetings, jubilees, balls, galas, etc. From the very first day of the existence of the church mission, great mind was given toward the preparation and education of children. Regular lessons in the parochial school began already in November of 1941 (with 12 students). At first, lessons were conducted in the parochial center, but by 1961 a special building for the school was constructed with 5 classrooms, and in 1973 the construction of the school was completed with 10 classrooms. The roster reached 120 students. The expansion of the parish dictated the necessity for construction of living quarters for ecclesiastics and their families. In 1950, a 4-apartment building was built for clergy, and in 1970 a rectory. In 1985 another house was built for a second priest, and the construction of a third parochial house was completed in 1987, and in 1996 a fourth parochial house was attained. Fr Valery Lukianov is one of the eldest clergymen in the Russian Orthodox Church Abroad. He is known in Russia through his multitudinous books and other publications. Fr Valery devotes particular attention in his labors on questions of Christian virtue, chronology and biography of crucial moments in the history of ROCOR, questions of liturgical order and liturgics. He received his blessing for the priesthood from St. John of Shanghai and San Francisco, with whom he had been acquainted from the time his family lived in Shanghai, being yet a child. Archbishop John ordained Fr. Valery into the diaconate. Fr. Valery’s pastoral career coincided with the First Hierarchs of ROCOR, Metropolitans Philaret (Voznesensky; ordaining Fr. Valery into the priesthood), VItaly (Ustinov), Laurus (Škurla), and now: Metropolitan Hilarion (Kapral). He was a students of the abbas of the Russian Diaspora, having now become part of history (Archimandrite Constantine Zaitsev, Archbishop Aversky Taushev, etc.). Under Fr. Valery Lukianov, on September 12, 1989, on the feast of St. Alexander Nevsky, the laying of the new cornerstone of the cathedral occurred. The Cathedral Projects was developed by architect N.S. Karsanoff. Fr. Valery, himself an engineer and builder by secular profession, also headed the development of the projects and all construction work. In 1994 the lesser consecration and first liturgy took place, and in 1996 frescoing began. A brigade of iconographers painted the cathedral under the direction of Hieromonk Andrei Erastov. Interior frescoing was completed in 2001. In the opinion of many pilgrims visiting the Cathedral, it stands out as one of the most beautiful in the Russian Diaspora. The cathedral belfry is beatified by 12 sweet-sounding bells cast in Holland. The great consecration of the Cathedral took place in October of 1997. The Rite of Consecration was performed by the First Hierarch of ROCOR, Metropolitan Vitaly (Ustinov), co-served by 6 archpastors and a plethora of clergymen – over 40 people. After the Great Consecration of the new St. Alexander Nevsky Cathedral had concluded, the old church was renamed in honor of the Icon of Our Lady of Tikhvin by a blessing of the Synod of Bishops of the Russian Orthodox Church Outside of Russia. A copy of this icon, preserved within the parish, is called “Royal” such as it belonged to Empress Alexandra Feodorovna. But in 1913, the Empress, as a benevolent gesture, gifted the icon to the clothier of the Imperial Court: O.V. Trofimova, who in the midst of processing the order for the occasion of the 300th Anniversary of the House of Romanoff received serious leg trauma. In 1972, the icon was given by Trofimova’s daughter to the Parish of St. Alexander Nevsky, where it is displayed to this day. The wonderful visage of the Mother of God, which constitutes a relic and adornment for St. Alexander Nevsky Parish, becoming the “church icon” of the original church in Lakewood, whose walls have been saturated with so many tears, prayers, sighs, and joyous exclamations of parishioners and pilgrims. At present, services mainly take place within the St. Alexander Nevsky Cathedral, but occasionally services are held in the church of the icon of Our Lady of Tikhvin. Church membership comprises of about 300 families, but thousands of faithful will gather on Easter. The events, meetings, and ceremonies hosted in the parish for the past 75 years of its existence can be explored ad infinitum. But however beautiful the history may be inscribed this or that church, monastery, or skete, it cannot comprise within itself that all-encompassing persistence of affection and emotion gained by those who searched and found comfort in the Lord and the intercession of His Most-Pure Theotokos. And may this joy in the Lord be in our hearts evermore! And may nothing impede it! For nothing may impede it while our soul is in Christ’s Church! The Church founded by Christ for the ages and until the end of ages!